For eight of the last 10 years, the world has gradually become a less peaceful place, due largely to increased terrorism and internal conflict, according to the Global Peace Index (GPI). In the past year alone, the global level of peace has dropped by 0.27%, the fourth such drop in a row, as tensions and conflicts, particularly in the Middle East, remain unresolved. But there are 13 countries topping the annual index, where the state of peace is “very high”. 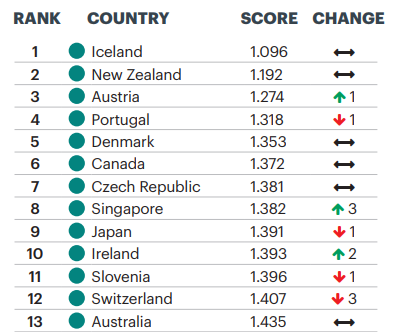 Iceland is the most peaceful country again, a position it’s held since 2008, followed by New Zealand and Austria. The GPI, produced by the Institute for Economics and Peace, ranks 163 independent states and territories by their level of peacefulness, based on three “domains”: Safety and Security; Ongoing Domestic and International Conflict; and Militarization. 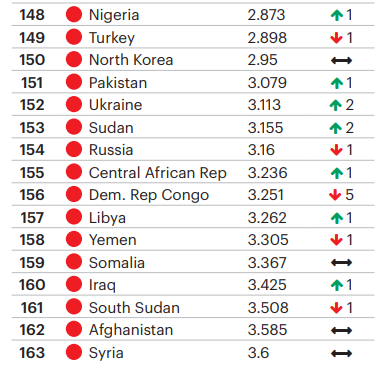 Syria is the least peaceful country – a position it’s held for five years – with Afghanistan, South Sudan, Iraq, and Somalia making up the rest of the bottom five. While the level of peace deteriorated in 92 countries over the last year, it improved in 71. The region experiencing the biggest improvement in peacefulness was South Asia – with India, Nepal, Bhutan and Sri Lanka all climbing the rankings. Gambia saw the biggest overall improvement in peacefulness of any country, moving up 35 places in the ranking to 75th, due to the election of new president Adama Barrow boosting political stability and the country’s relations with its neighbours. Despite being the world’s least peaceful region since 2015, the Middle East and North Africa (MENA) saw an improvement in peacefulness for the third time in 11 years. Qatar had the biggest single drop in peacefulness, due to political instability and relations with neighbours worsening over the political and economic boycott by the United Arab Emirates, Saudi Arabia, Egypt, and Bahrain. 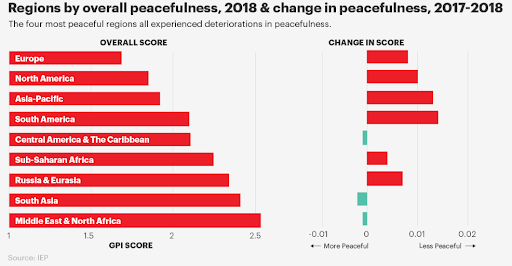 The four most peaceful regions – Europe, North America, Asia-Pacific and South America – all saw a drop in peacefulness, which was most pronounced in South America, due to terrorism and an increase in the incarceration rate. For the third year in a row, Europe, the world’s most peaceful region, saw a drop in peacefulness, across all three domains, but significantly for political instability, the impact of terrorism and perceptions of criminality. Spain fell 10 places to number 30, making it the first time a Western European country had been among the five countries where peacefulness had deteriorated the most. This was due in part to the independence referendum in Catalonia sparking political tensions. 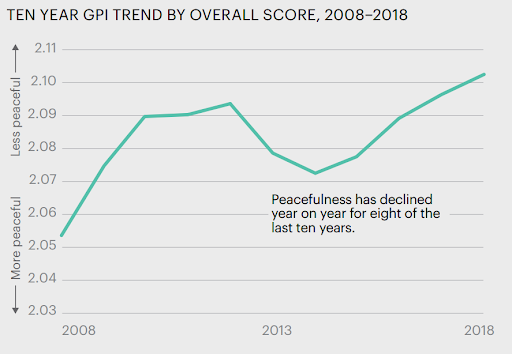 In the past decade, overall peacefulness has slowly declined and the gap between the least and most peaceful countries has grown. Since 2008, there was an average drop in peacefulness of 12.7% among the 25 least peaceful countries, with an improvement of 0.9% among the 25 most peaceful ones. 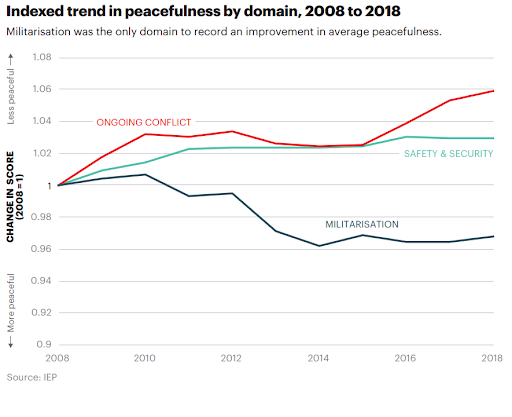 Of the three domains used to measure peacefulness, there was a drop of 5.9% in Ongoing Conflict and of 2.9% in Safety and Security. But not everything is getting worse – the average country score for Militarization improved by almost 3.2% over the decade, due to less spending on military and shrinking armed forces.